Definition at line 28 of file CExpression.h. Definition at line 26 of file CExpression.cpp. Definition at line 36 of file CExpression.cpp. Definition at line 47 of file CExpression.cpp. Definition at line 122 of file CExpression.cpp. Referenced by SBMLImporter::applyStoichiometricExpressions(), CEvaluationNodeCall::calculate(), CModelEntity::calculate(), COptProblem::calculate(), CMathTrigger::calculate(), CMetab::calculate(), CMathEvent::calculateDelayedTime(), CModelEntity::compile(), CMetab::compileInitialValueDependencies(), refresh(), CMetab::refreshInitialConcentration(), and CModelEntity::refreshInitialValue(). Definition at line 97 of file CExpression.cpp. 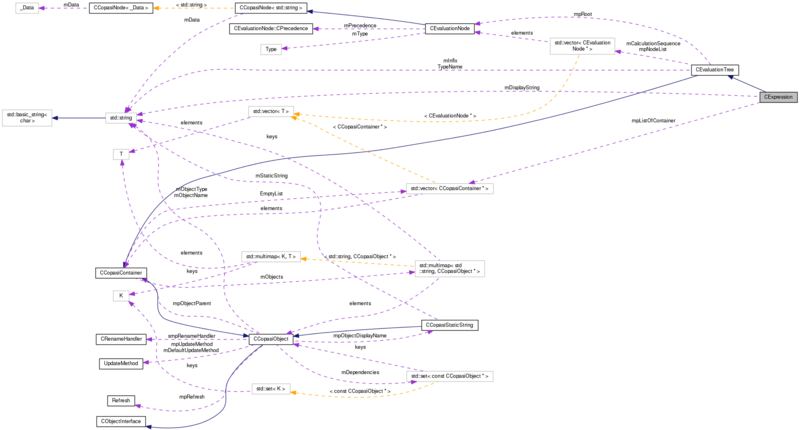 References CEvaluationNode::buildDisplayString(), CEvaluationNode::buildInfix(), CEvaluationTree::compileNodes(), CCopasiObject::getObjectParent(), mDisplayString, CEvaluationTree::mInfix, mpListOfContainer, and CEvaluationTree::mpRoot. Referenced by CMathEventN::CTrigger::allocate(), SBMLImporter::applyStoichiometricExpressions(), CMathEventN::CAssignment::compile(), CEventAssignment::compile(), CEvaluationNodeCall::compile(), CModelEntity::compile(), CMathEventN::CTrigger::compile(), CMathTrigger::compile(), CModelParameter::compile(), CEvent::compile(), CMathEventN::compile(), CMetab::compile(), CMathEvent::compile(), CMetab::compileInitialValueDependencies(), CModelExpansion::duplicateEvent(), COptProblem::initialize(), CEvent::setDelayExpressionPtr(), CMathObject::setExpression(), CEventAssignment::setExpressionPtr(), CEvent::setPriorityExpressionPtr(), and CEvent::setTriggerExpressionPtr(). Creates the corresponding initial expression for the given expression by converting each transient value to the corresponding initial value. Definition at line 219 of file CExpression.cpp. References CExpression(), CCopasiObject::getCN(), CMetab::getConcentrationReference(), CMetab::getInitialConcentrationReference(), CModelEntity::getInitialValueReference(), CCopasiMessage::getLastMessage(), CEvaluationTree::getNodeList(), CCopasiContainer::getObject(), CEvaluationNodeObject::getObjectCN(), CCopasiObject::getObjectParent(), CModelEntity::getValueReference(), CEvaluationNodeObject::setData(), CCopasiMessage::size(), and CEvaluationTree::updateTree(). Referenced by CModelEntity::compile(), CMetab::compile(), and CModelEntity::setStatus(). Retrieve the display string in Berkeley Madonna syntax. Definition at line 175 of file CExpression.cpp. Retrieve the display string in C syntax. Definition at line 163 of file CExpression.cpp. Retrieve the human readable display string. Note, the expression must be compiled for this return a displayable string. Definition at line 160 of file CExpression.cpp. Referenced by CQParameterOverviewDM::assignmentData(), CQEventDM::data(), CQGlobalQuantityDM::data(), CQCompartmentDM::data(), CQSpecieDM::data(), and operator<<(). Definition at line 148 of file CExpression.cpp. Retrieve a pointer to the object defined by CN. This method may only be called during compile() since the list mpListOfContainer is only valid then. Definition at line 132 of file CExpression.cpp. References CCopasiDataModel::getDataObject(), CCopasiObject::getObjectDataModel(), mpListOfContainer, and CCopasiDataModel::ObjectFromCN(). Retrieve the display string in XPPAUT syntax. Definition at line 187 of file CExpression.cpp. Definition at line 49 of file CExpression.cpp. References CCopasiContainer::getObject(), refresh(), and CCopasiObject::setRefresh(). Definition at line 129 of file CExpression.cpp. Referenced by CMathTrigger::CRootFinder::initObjects(), and initObjects(). Definition at line 63 of file CExpression.cpp. References CEvaluationNode::isBoolean(), mIsBoolean, CEvaluationTree::mpNodeList, CEvaluationTree::mpRoot, CEvaluationTree::setInfix(), and CEvaluationNode::VARIABLE. Referenced by CMathEventN::CTrigger::allocate(), CMathEventN::CAssignment::compile(), CMathEventN::CTrigger::compile(), CMathTrigger::compile(), CMathEventN::compile(), CMathEvent::compile(), CMathObject::compileDependentMass(), CMathObject::compileParticleFlux(), CMathObject::compilePropensity(), CMathObject::compileTotalMass(), CMathObject::createExtensiveODERateExpression(), CMathObject::createExtensiveReactionRateExpression(), CMathObject::createExtensiveValueExpression(), CMathObject::createIntensiveRateExpression(), CMathObject::createIntensiveValueExpression(), CCopasiXMLParser::FunctionElement::end(), CEvent::setDelayExpression(), CEventAssignment::setExpression(), CMathObject::setExpression(), CModelEntity::setExpression(), CModelParameter::setInitialExpression(), CModelEntity::setInitialExpression(), COptProblem::setObjectiveFunction(), CEvent::setPriorityExpression(), and CEvent::setTriggerExpression(). 69 // Check whether the expression has the expected type. Definition at line 58 of file CExpression.cpp. Referenced by CMathEventN::CTrigger::allocate(), CMathEventN::CTrigger::compile(), CQValidatorExpression::CQValidatorExpression(), SBMLImporter::importEvent(), CQValidatorExpression::setBooleanRequired(), CMathObject::setExpression(), and CEvent::setTriggerExpression(). Definition at line 151 of file CExpression.cpp. References CEvaluationNode::buildInfix(), CEvaluationTree::mInfix, CEvaluationTree::mpNodeList, and CEvaluationTree::mpRoot. Referenced by CEvent::getDelayExpression(), CEventAssignment::getExpression(), CModelEntity::getExpression(), CModelEntity::getInitialExpression(), CEvent::getPriorityExpression(), and CEvent::getTriggerExpression(). Definition at line 201 of file CExpression.cpp. References CEvaluationNode::buildMMLString(), CEvaluationTree::mpRoot, and SPC. Referenced by CQExpressionWidget::writeMathML(), and CMMLOutput::writeRHS_ModelEntity(). Definition at line 161 of file CExpression.h. Referenced by compile(), and getDisplayString(). Indicates whether the expression is boolean or not. Definition at line 166 of file CExpression.h. Referenced by setInfix(), and setIsBoolean(). Pointer to the list of containers used for compilation. Definition at line 156 of file CExpression.h. Referenced by compile(), getListOfContainer(), and getNodeObject().